Intramedullary spinal cord tubercular abscess with involvement of whole cord is a rare entity that too with syrinx formation is even rarer. , Till date only 83 cases of intramedullary abscess of tubercular etiology have been reported in the literature with only six cases of holocord and with only one case of syrinx since the original description by Marinesco in 1916. , Besides an adequate clinical history, a high index of suspicion and imaging features helps in diagnosis. 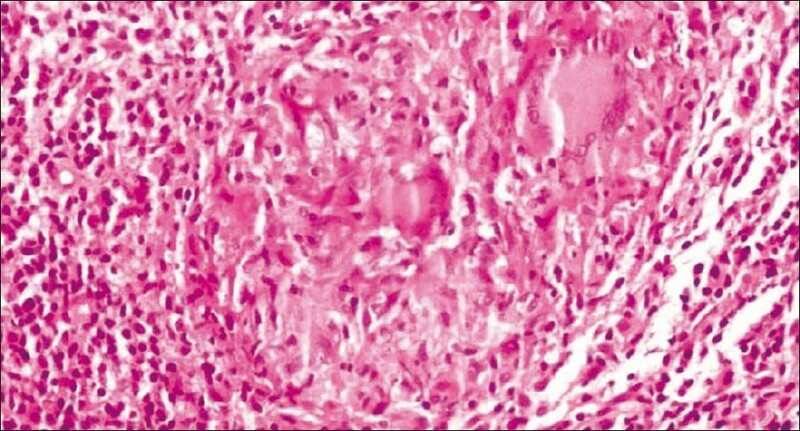 A 4-year-old boy presented with fever and acute flaccid paralysis for the past 6 months. After a detailed physical examination, provisional diagnosis of complicated meningitis was made. His lumbar puncture examination revealed few lymphocytes and increased protein content. The patient was given antibiotic but it was not optimally effective. Finally, the patient was subjected to Magnetic resonance imaging (MRI) of the brain and spine to determine the cause. MRI investigation revealed expansion of cord and dilated central canal with altered signal intensity in cord parenchyma ranging from the cervicomedullary junction to conus medullaris, which was iso- to hypointense on T1, heterogeneously hyperintense on T2WI. T1 fat suppressed Gadolinium-enhanced sequences revealed peripheral enhancement with central hypointense areas from D6 vertebral level to conus medullaris consistent with inflammatory collection [Figure 1] and [Figure 2]. It also showed significant syrinx formation from D1 to D6 vertebral level with evidence of altered signal intensity in cord parenchyma [Figure 3]. His brain MRI also revealed significant communicating hydrocephalus. Following MRI, the patient underwent surgery for drainage and confirmation of the etiology. Partial laminectomy was performed and through a midline myelotomy intramedullary abscess was drained. The spinal cord which was distended became lax after the surgical procedure. The necrotic pus-like tissue collected was sent for culture and histopathological examination. 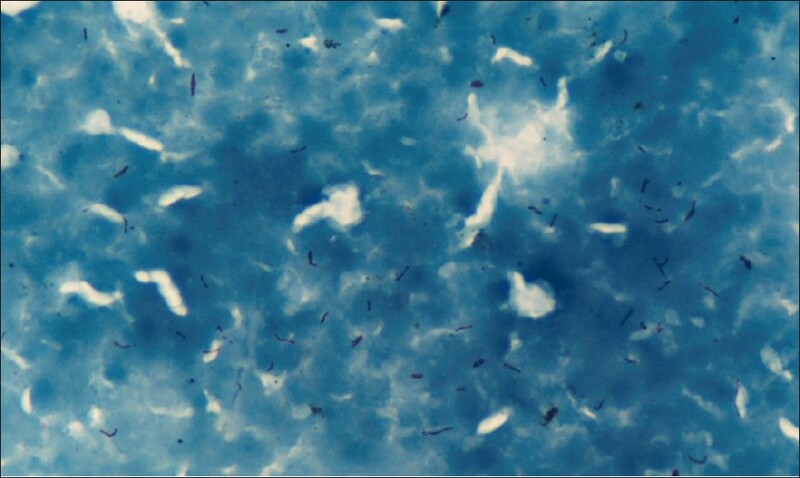 Histopathological examination showed the presence of chronic inflammatory cells with caseating epithelioid cell granuloma and ZN staining was also performed on sections which showed AFB positive bacilli [Figure 4] and [Figure 5]. Culture showed acid fast bacilli confirming tubercular nature of the lesion. Postoperative recovery was uneventful with rapid improvement of clinical symptoms and the patient was discharged with ATT with an advice for regular follow-up. This entity is usually seen in children and is more common in male patients. A total of 40% of the abscesses occur in first two decades with 27% occurring before the age of 10 years. The incidence of spinal cord abscesses is significantly low compared to brain abscess. This has been attributed to its peculiar blood supply and the lower volume of spinal cord. These abscesses can be solitary or multiple or can involve the entire cord , as seen in our case. The most common location of solitary abscess formation in the cord is the thoracic region. Clinical features range from back pain, fever and tenderness in acute stage to chronic symptoms such as progressive paraplegia, numbness and paresthesia. , Various case reports have described the differing and varied clinical presentations. Diagnosis of spinal cord tubercular abscess can be made from positive tissue culture or detection of acid fast bacilli but a previous study has shown that in most cases culture remains sterile. Commonly isolated organisms are staphylococcus and streptococcus in developed countries and mycobacterium in developing countries. ,, Viruses, fungi, cysticercus, listeria, toxoplasma, and Brucella More Details may also be isolated. Radiologic investigations are unlikely to be conclusive. However, imaging especially MRI is relatively more sensitive which helps in detection, precise localization, and extent of the abscess. MRI demonstrates the hypointense signal on T1W and the hyperintense signal on T2W sequences. On postcontrast fat suppressed T1 sequence peripheral contrast enhancement around the abscess appearing as classical "ring sign" is typical of an abscess. ,, Similar findings were noted in our case which revealed peripheral enhancement ranging from D6 to conus medullaris [Figure 1] and [Figure 2]. Besides this, a proximal syrinx formation was also observed in our case as seen in the T2W sagittal image [Figure 3] which has not been reported previously. MRI is therefore a radiological study of choice for both diagnosis and management. 1. Desai KI, Muzumdar DP, Goel A. Holocord intramedullary abscess: An unusual case with review of literature. Spinal Cord 1999;37:866-70. 2. Tanriverdi T, Kizilkiliç O, Hanci M, Kaynar MY, Unalan H, Oz B. Atypical intradural spinal tuberculosis: Report of three cases. Spinal Cord 2003;41:403-9. 3. Hanci M, Sarioglu AC, Uzan M, Iºlak C, Kaynar MY, Oz B. Intramedullary tuberculous abscess: A case report. Spine (Phila Pa 1976) 1996;21:766-9. 4. 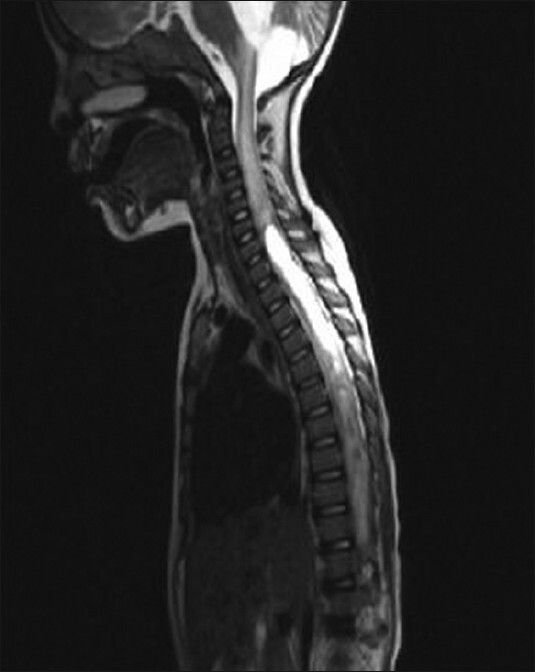 Fehlings MG, Bernstein M. Syringomyelia as a complication of tuberculous meningitis. Can J Neurol Sci 1992;19:84-7. 5. Kalia V, Vibhuti, Aggarwal T. Holocord intramedullary abscess. Indian J Pediatr 2007;74:589-91. 6. Guzel N, Eras M, Guzel DK. 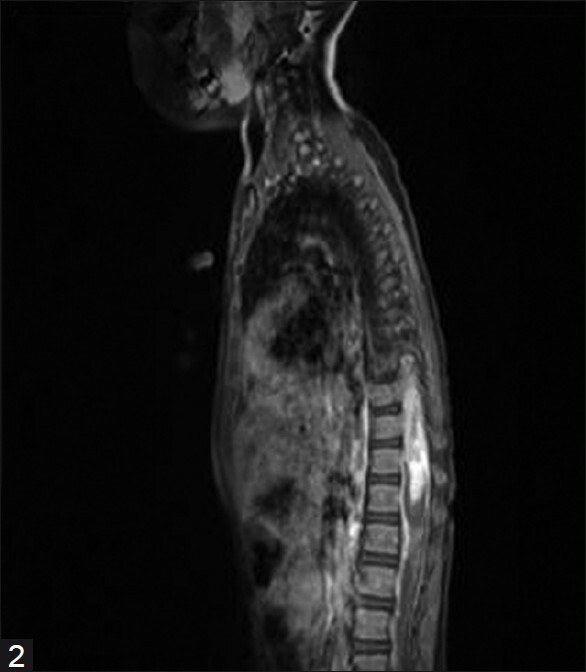 A child with spinal intramedullary abscess. Childs Nerv Syst 2003;19:773-6. 7. Miranda Carús ME, Anciones B, Castro A, Lara M, Isla A. Intramedullary spinal cord abscess. J Neurol Neurosurg Psychiatry 1992;55:225-6. 8. DiTullio MV Jr. Intramedullary spinal abscess: A case report with a review of 53 previously described cases. Surg Neurol 1977;7:351-4. 9. Murphy KJ, Brunberg JA, Quint DJ, Kazanjian PH. Spinal cord infection: Myelitis and abscess formation. AJNR Am J Neuroradiol 1998;19:341-8. 10. Devi BI, Chandra S, Mongia S, Chandramouli BA, Sastry KV, Shankar SK. 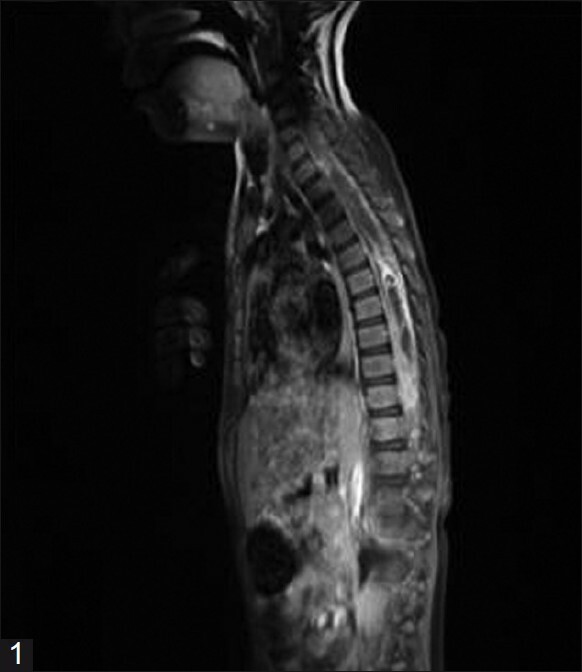 Spinal intramedullary tuberculoma and abscess: A rare cause of paraparesis. Neurol India 2002;50:494-6. 11. Sharif HS, Clark DC, Aabed MY, Haddad MC, al Deeb SM, Yaqub B, et al. Granulomatous spinal infections: MR imaging. Radiology 1990;177:101-7. 12. Gupta VK, Sharma BS, Khosla VK. Intramedullary tuberculoma: Report of two cases with MRI findings. Surg Neurol 1995;44:241-3; discussion 243-4. 13. Shen WC, Cheng TY, Lee SK, Ho YJ, Lee KR. Disseminated tuberculomas in spinal cord and brain demonstrated by MRI with gadolinium-DTPA. Neuroradiology 1993;35:213-5. 14. Rao GP. Spinal intramedullary tuberculous lesion: Medical management. Report of four cases. J Neurosurg 2000;93 Suppl 1:137-41. Khalid, M. and Khalid, S. and Mittal, S. and Ahmad, U.
Da Silva, P.S.L. and De Souza Loduca, R.D.